Pleasantville, New York: Reader's Digest Association, 1990. 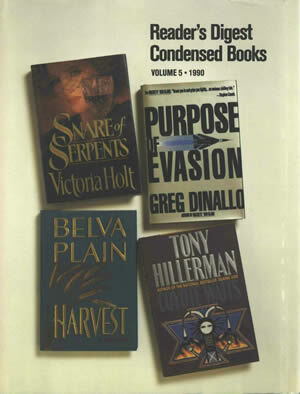 This first edition Reader's Digest Condensed Books volume contains an edited reprint of Tony Hillerman's Coyote Waits. It also contains novels by Victoria Holt, Greg Dinallo and Belva Plain. This is a hardcover book with dust jacket. The top edge is gilded. The front cover displays thumbnails of the included novels. The spine reads "Reader's Digest Condensed Books VOLUME 5 - 1990" in white on a red background, and also displays the titles and authors of the included novels. The back cover displays "RAVE REVIEWS for the books in this volume" and praise for each of the novels in a different-colored section. This volume does not have a clear plastic cover over the dust jacket. This volume is contained in a cardboard case labeled "40th ANNIVERSARY READER'S DIGEST CONDENSED BOOKS." Binding: Quarter bound, red and white speckled boards with dark blue vinyl tape. Printed on the spine in gold letters within gold-bordered red rectangles are the words "READER'S DIGEST CONDENSED BOOKS | VOLUME 5 [bullet] 1990" and the titles of the included novels.